Here is the jacket I made last year in the California Rags technique that I did after a workshop by Trudie Roberts on finishing techniques. My Christmas jacket will have a similar style. The fabric unwoven looked like a table cloth with giant grapes. The women at the store asked me if I was making a tablecloth! When I explained to her that I was going to deconstruct the fabric by making fabric strips and re-construct it by then weaving it with chenille - she gave me this kinda dazed look. The giant grapes in the fabric compressed once woven in strips. I used a variegated yellow and green chenille for the weft yarn which alternates with the fabric strips. 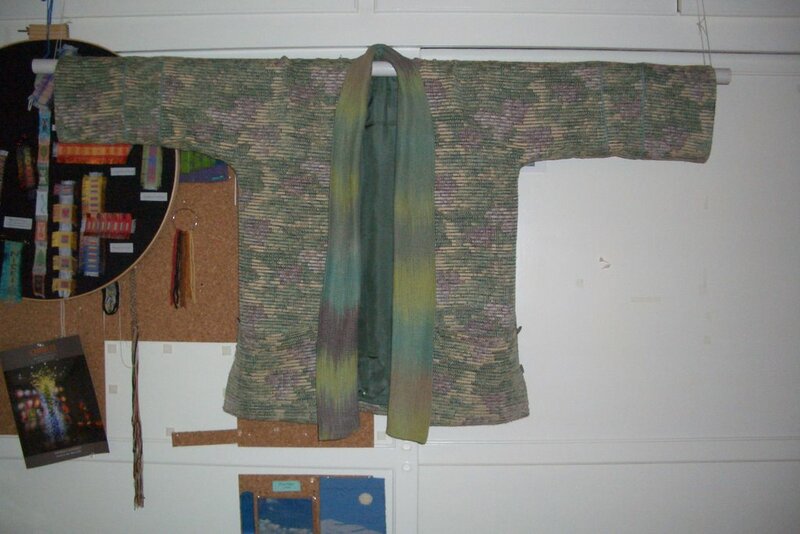 The lapel was hand painted silk warp done in a plain weave. I experimented with many finishing techniques. There is piping which matches the lining around the lapel and on the sleeves There are lined hefty pockets and fabric covered buttons. The sleeves are also lined so when folded up the lining can show if so desired. This was fairly complex to sew...at least for me...it's the third piece of clothing I have ever sewn - and without any pattern. I also seem to have a problem following patterns so a no-pattern jacket for me is a plus! The fabric is heavier than the Christmas fabric I just wove, so my new jacket should be a bit lighter than this one. This one is only for cool days.